Remove the teabags after the set steeping time. Your unsweetened ice tea will generally last 3 days in the fridge for the freshest taste. 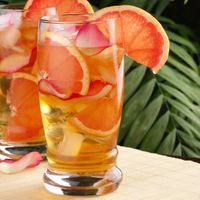 A great iced tea doesn't just end with the tea itself; there are many different things you can add to give your cup a unique and natural flavor. 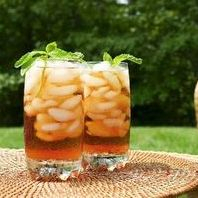 Sweeteners: Instead of using white sugar, sweeten your iced tea with honey. Dissolve the honey in your tea while it's still hot so it doesn't sink to the bottom of the pitcher. You can experiment with more expensive local honeys for distinct flavors. The flowers that the bees are gathering pollen from will determine the flavor, clarity, and sweetness of the honey. Edible flowers: Edible flowers such as chamomile, honeysuckle, jasmine, lavender, lilac, rose, and violet provide a sweet, nectarlike flavor to teas, which is why many of these flowers are used to create scented or flavor-infused teas. If you don't access to any of these, try a splash of rose water or orange blossom water after the tea is brewed. Citrus slices: Grapefruit, orange, lemon, and lime are just some of the many citrus fruits to slice up and add for a delectible pitcher of iced tea. Wedges, thin wheels, twists, or other cocktail garnish cuts will do the trick. For something more exotic, try kumquats, this tart citrus fruit is often used in iced teas found in Asian countries. Fresh herbs: Rosemary, mint, sage, and basil can be added to the glass as a garnish. For a more intense flavor, brew the herbs with the tea itself. Fruit juices: You can add any fruit juice to your iced tea, but tart varieties like cherry, pomegranate, cranberry, and lemonade complement the tannins in the tea and offer a crisp, refreshing finish. Try freezing fruit juice in ice cube trays so the flavor of the tea doesn't dilute as the ice melts.